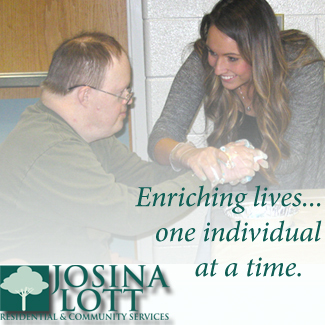 Thank you for your interest in volunteering and sharing our mission of enriching the lives of individuals with disabilities. All volunteers are required to attend orientation before serving at Josina Lott. Orientation lasts one hour, which counts toward required service hours. Volunteers must be 14 or older. Orientations will be held at Josina Lott Residential & Community Services, 120 S. Holland-Sylvania Rd., Toledo, OH 43615 in the Multipurpose Room of the Activities and Education Building. Email questions to [email protected] or call Melissa Gregg at 419-866-9013 Ext. 109 OR Deb Berezowski at 419-866-9013 Ext. 100. Thank you for your support of adults with developmental disabilities. We look forward to seeing you soon! Join us - get physical, stay active! Bring a bagged lunch and join us for a picnic in the park! Spend some time volunteering with individuals and our friends in the community. Stay for an hour or stay all day! Play bingo, board games, shoot some hoops. Join us! Join us for coffee in the Porter Gallery before attending a medley of student performances in the attic theater. No expertise needed, we keep it simple so we can enjoy learning new culinary skills. The Toledo Museum of Art's collection of more than 30,000 works of art ranks among the finest in the world. New Volunteer Orientation. Session lasts one hour. Join us as we volunteer in support of a great cause and give back to the community that has given us so much! Graceful Friends is a faith based program at Grace Lutheran Church. Each month individuals take part in services at Grace with bible stories, activities and refreshments included. Join us as we explore a local treasure - our own Toledo Zoo! A forum for individuals with special needs who want to improve their ability to advocate for themselves. Join the ladies for dinner and fun!